We saved Sheep Thrills for the last stop on our marathon southeast Florida yarn tour; partly because it was open late on Thursdays, partly because it was the northern-most shop on our list, and partly because we had been there before and knew we could skip it if we were completely exhausted. We are SO glad we didn’t skip it! The first time we went to Sheep Thrills, we happened to wander into the midst of a Stacy Charles/ Tahki trunk show, and to say the shop was busy would be an understatement. To give you some background, Becky and I …. Well…. We don’t like people. 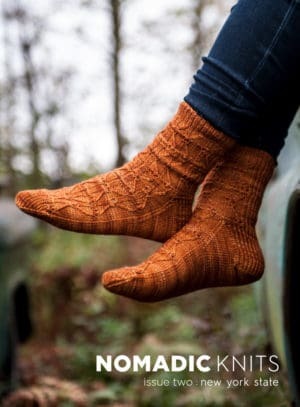 We like individuals, and we especially like knitters in general, but we tend to avoid people-y things and events (you may find one of us at Rhinebeck curled up in the fetal position under a pile of yarn, hyperventilating into a paper bag). So we were a touch overwhelmed to find ourselves amongst a throng of excited knitters. See, here’s the thing; Sheep Thrills knows how to put on an event. This wasn’t just a lovely display of the latest collection of designs. No. This was a runway fashion show, with models (okay, shop employees and regulars, but still! ), with Stacy Charles himself announcing each piece as it walked. It was quite the day! So here we were for our second trip to Sheep Thrills, on a more typical Thursday evening. The shop is huge and very beautifully laid out. There was a table full of knitters, several customers squeezing the yarn, and a peaceful energy in the air. We were welcomed kindly by Patti, the owner, who recognized us from the first time we were in (I love that!). She enthusiastically showed us around the store and shared with us her love of all things yarn. Patti is enthusiastic about supporting Florida dyers (Yay!) and proudly carries The Fiber Seed, Prism, Knit One Crochet Too, and Sassy Skeins. 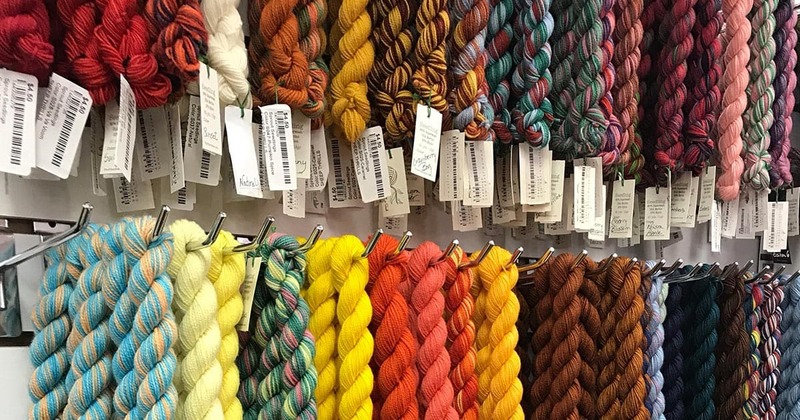 Patti’s love of fiber arts and the community is infectious and can be seen mirrored in her loyal customers, who frequently knit, crochet, and weave beautiful shop samples. The most difficult part of this visit was reining ourselves in from being total yarn pigs! This is much easier said than done (I specifically have poor willpower when it comes to yarn, as most drastically demonstrated last year at NY Sheep & Wool when I went home with 27 sweater quantities- no exaggeration!) in the presence of Hedgehog Fibres (over 100 colorways! ), Anzula, Shibui, Malabrigo, Sweet Georgia, Madelinetosh, Baah, Artyarns, Three Irish Girls…. I could go on for the rest of the page and still not list everything. The selection of each is enormous, too; you will never have trouble finding a complete sweater quantity, finding your fade, grabbing your gradient, selecting your stripes, rediscovering your rainbow (okay that last one was a bit of a stretch); you’re more likely to struggle to pick just one! What are you waiting for? Drop your family off at the beautiful Fort Lauderdale beaches, and go unwind at Sheep Thrills. Tell Patti we sent you!